Amazon's new Kindle electronic book reader has some truly compelling features, several issues and a few surprises. It may change the way I read books. I heard you got a Kindle. What do you think of it? That's actually a made-up question, but I expect people, particularly some of my more techie friends, to be asking me very soon. Hence, this article to answer it for everyone. The other day my wife asked me what I wanted for Christmas. I told her to wait until Monday and I might have an answer. After Amazon's announcement I spent some time reviewing the device's specifications and decided. Reading other reviews it appears that people tend to fall very strongly on one side or the other when it comes to Kindle. They either love it or they absolutely hate it. I'm closer to love than hate, but there are most definitely some areas where Amazon has at a minimum missed some extremely compelling opportunities. On the other hand, some aspects are incredibly exciting, not only for what they are today, but for the promises of things to come. Electronic books are actually nothing that new with the advent of so-called "electronic paper" in recent years. The Sony Reader has been out for some time and competes with the Kindle in this space. The electronic paper display is, to me, quite readable. There's been some complaint about e-paper in general not being "white enough", but it just doesn't seem a problem to me. Some folks are annoyed with the page flash that happens when you change from one page to another. Again, I just don't see this as an issue and overlook it easily. One thing you should note is that e-paper is not backlit. Unlike a computer screen or PDA, you'll need ambient light in order to read it. Much like, dare I say it, a paper book. For its basic function, reading, after purchasing a book I found using it to be a very pleasant and comfortable experience. It's compact, lightweight, and easy to use at a moment's notice. I put it in a large pocket and took it to the airport with me where I read while awaiting a friend's arrival. Many readers will appreciate the ability to easily and quickly change the font size. I happened to make it a notch smaller than the default, but it has a wide range. There are flaws. As many people have reported, it's extremely easy to accidentally push the "next page" bar, which runs nearly the length of the right side of the device. I also find myself accidentally hitting the Previous and Next page bars on the left as well. I think the intentions of the button placement are good - making it easy to navigate from page to page - but perhaps they made it too easy. I find myself training myself to hold it in particular ways to avoid the issue. Ideally I shouldn't have to do that. The user interface takes a little getting used to. 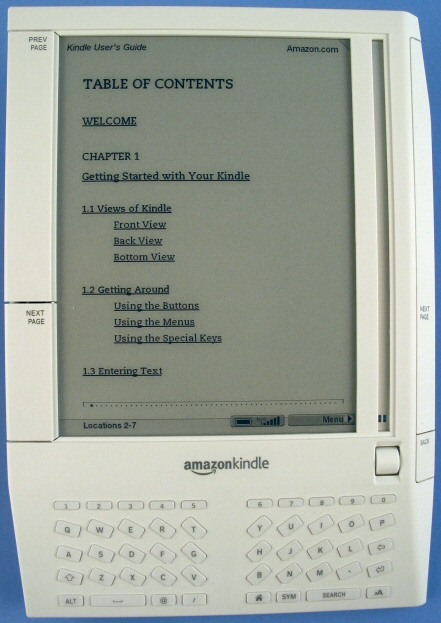 The roller button (to the right of the Amazon/Kindle logo) is used for most all non-page turning actions, controlling a dynamic cursor in the bar immediately above it. The roller and cursor are quick and easy, the issue is simply the menu structure itself: I find items aren't quite always where I might expect and the structure takes some getting used to. Buying books is easy. In fact, in a stroke of marketing genius, buying books is almost too easy. To be fair, Amazon does a good job of not only presenting detailed information prior to purchase, but you can download the first chapter of most books for free. This is a great way to quickly and easily either get hooked on a book or decide it's not for you. Buying books is fast. Amazon calls it a "Wireless Reading Device", and that "wireless" is mostly about its connection to the Amazon store via a ubiquitous cellular network. Searching and browsing are performed online and are quick and easy. Once purchased books appear on your Kindle in mere seconds. Amazon is smart: my Kindle came pre-programmed with my name and for my Amazon account. In other words when it arrived I needed to do nothing to configure or "log in" to the device or the Amazon store. It was ready to go. Some might also argue that's a bit of a security risk, as anyone who can lay hands on your Kindle can start spending your money. The good news here is that your Kindle's relationship to your Amazon account can be managed via the web without the device. In other words, if you lose your Kindle, you can disassociate it from your account quickly. Kindle offers subscriptions to major magazines and newspapers. I tend to avoid subscription payments in general, so I've avoided these so far. For people who are religious readers of publications like The New York Times, The Wall Street Journal and others, this could be a very lucrative way of having the latest issues with you automatically and at all times. Subscriptions to many popular blogs are also available for a fee, but not only do I sort of balk at paying for something I can get on my computer for free, there's another approach I'll get to in a moment. Let's see ... wireless access, and doesn't that store kind of look like a web page? Doesn't that make you think of something else? Tucked away in a menu labeled "Experimental" lay some of Kindle's greatest teases and greatest promises, in my opinion. 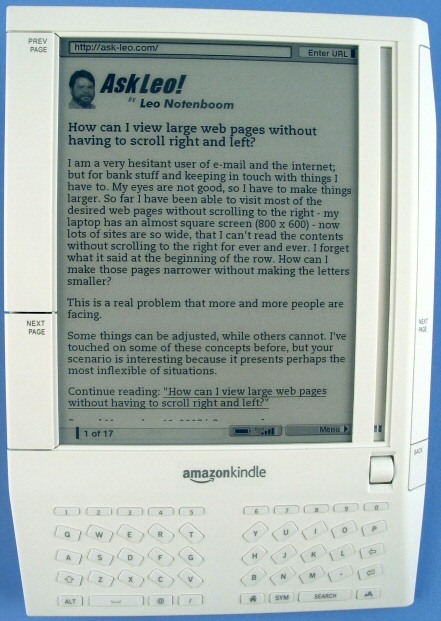 Kindle has a web browser. In default mode (shown here), much of the HTML formatting is disabled, but as you can see here in this Ask Leo! example, it works. In fact, for sites consisting primarily of text-based information, it works quite well. Remember, there's no monthly fee. Once you have a Kindle, you have a basic web browser that you can use for free. While at the airport, I even looked up my friend's arrival status from the airline website - on my Kindle. My biggest fear is that "Experimental" means that Amazon may take it away some day. My second biggest fear is that they'll start charging a subscription fee for access. With a v2 browser, though, it might well be worth it. Kindle has an mp3 player. Sort of. Also part of the "experimental" portion of Kindle, the mp3 player is a promise unfulfilled, and the reason is simple: it has no user interface. As far as I can tell, once you put mp3's on your Kindle, all you can do is press play. Kindle will choose the mp3 to play. From what I can tell if you have multiple mp3 files, each successive "play" will play a different mp3, but that's about it. There's hope here, since a UI should only be a software update. But I'm guessing that the lack of UI is Amazon's reason for positioning it only as a way to play background music while you read. Me? I want to listen to podcasts. Kindle apparently competes with Ask Leo! with the Ask Kindle NowNow experimental feature. Using the wireless network your question (about anything, not just tech) is sent to "real people" who will send an answer back to your Kindle in about 15 minutes. Nope, I haven't tried it yet. USB: if all you ever do is download and read books you can completely ignore the USB connection. However when connect Kindle to your PC it's "just a drive". No drivers or other software required. Just copy other documents, mp3s or whatever to the device. Clippings: these are kind of a quick clipboard where you can easy to capture snippets of page text as you read. They're readily available as simple text files when you're connected via USB. SD memory expansion: Kindle's memory is expandable with SD memory cards. I believe these show up as a separate drive when connected via USB to your computer. PDF's are not supported. Hopefully they will be some day. The SD card is accessible only by removing the back of the device. Platforms and DRM restrictions: your Kindle books can be read only on your Kindle. Perhaps using the iTunes model, a PC-based version of its software would allow your purchases to be usable in more than one place. Content search: the one function that an electronic version has that no paper version ever could. Document conversion: There's a conversion function where you can email a document to an email address specific to your device and have it delivered automatically in a Kindle-compatible format. 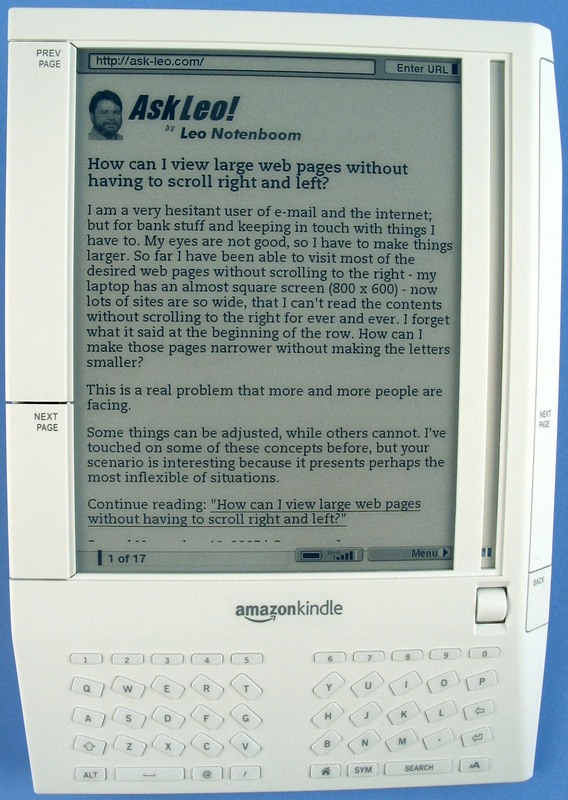 You must remember that Kindle is a electronic book device. It requires ambient light. Even though it might have long life, when the battery runs out you can't read until you find power. When you purchase a book it's only on your Kindle, making it difficult to share, as so many people do with paper books. Kindle's a version one product, and while I don't often do or recommend v1 products, Kindle impresses me. It does so as much with its promise of things to come as with the feature set it delivers today. There are problems, but for me at least most are things that I can live with. My greatest disappointment is actually with the opportunities that haven't yet been fulfilled; things like web browsing and mp3 playback. I'm looking forward to a firmware update to address some of those (I hope they can do that transparently and over-the air), and to Kindle's version 2. At nearly $400 Kindle's not for everyone, and it's certainly not for every book. Some obviously need to be on paper, and in color, to be enjoyed properly. But all that aside, I think Kindle might end up changing the way I read books. I've had a Sony e-Book reader for several months and I find myself using it a lot more than I thought I would. The Sony Reader's SD memory slot is easily accessible, so I typically leave a card in my computer and transfer files to the SD card that I can use in my Sony Reader "to go." It would be great to have the Kindle's always-on web browser, but for now the Sony Reader is adequate for what I use it for. And who can forget the first portable book reader, the Sony Data Discman. It was a tiny little player with a tiny little screen. The content was distributed on tiny little CDs. Early versions were criticized for their poor search and annotation capabilities. These were addressed with a redressing of the reader engine; a little piece of software that Leo and I were part of. Leo's no stranger to digital books - in fact, you might consider him to be a real pioneer, having worked on them nearly 20 years ago. Odd that Amazon names their replacement for paper books with a word that has to do with burning things. I don't care what features it has. It makes me think of people burning books and I'm not buying it. I've seen the Sony Reader, and it looks impressive. I'm curious if there are any side-by-side comparisons between the Reader and Kindle available? While the wireless internet access could be quite useful, I wonder if there are any other features that justify the higher price? The first question that I had was does it have a "bookmark" feature? Like putting a piece of paper in a real book to mark your location, and/or a sticky note to mark the location on the page. I read about this; however, I just got a Palm Treo 680 smartphone a couple of months ago. I have to have a backlight, as before in the old Palm III, it was too much eye strain to read. The last Palm m515 was good to read with a backlight, too. Here the Palm Treo 680 is multiple use item so a better investment for me. I can go to many places and get e-books; I go to the Palm store, to the Adobe Digital Reader, to The W. Project for old books, and more, then play a crossword puzzle, and check email,etc all on the same machine. Well, Maybe in the future, with more improvements, I might look into it..... The backlight is very important to me so that is why it's mainly a "no" for me at this time. re kindle. It all seems a tad expensive to me . this is what i do when i go on holiday. i bought a 4gb mp3 player for thirty pounds . To increase the usage time, why not add a strip of solar cells somewhere on the front to charge the battery? This might give it enough power to have backlighting? Also, what are the possibilities of using the Kindle for school books? 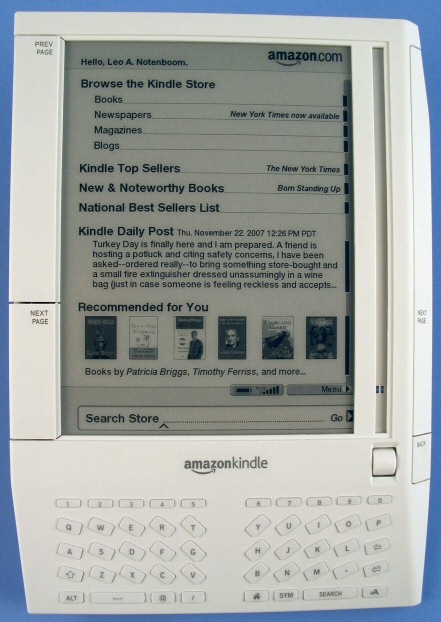 The Kindle could hold several books plus reference material such as a dictionary, encyclopedia, atlas, etc. With one of these children would not need backpacks bigger than they are. I have a Kindle and a Sony e-book reader (1st gen). The Kindle is so much easier to use. I especially like the ability to email documents to account_name@kindle.com and have them converted and automatically loaded to the device. Also, my previously purchased ebooks in mobi format are trivial to load. I agree with the comment about the Next-Page button on the right side being too big and too easy to press by accident. Also, the book doesn't stay in the cover very well unless you use the elastic strap over the lower right corner. This can also accidently hit a button and there should be a beveled area in the corner for this imo. For the previous poster who asked about a bookmark feature, it does support bookmarks although it will also remember your place automatically so you only really need them if you are skipping ahead or moving around inside the document. wondering if i can purchase and download kindle audiobooks and then listen to them on my PC with iTunes or different player? does the kindle offer the ability of making folders and writng notes,, i mean can i take with me to class and write notes with the teacher? No folders, and no notes that aren't associated with a book. You can write notes on a book - for example you can highlight a passage and then write a lengthy note that is saved with that passage. FWIW: the keyboard does not lend itself to easy typing, unfortunately. The problem as I see it is that I have to connect to the internet everytime I want to read what I download from Amazon. I spend a lot of time in places where there is no internet connection. I have built a small collection of books on my 2g card with my reader and there are still places available where I can get books to take with me, but they are getting rarer as Amazon and Adobe hunt them down and slay them. So until Amazon, or whoever allows me to pay for a book, download it to my card and take it to the arctic, or wherever, I'll stay with my Aluratek, which has proved reliable. I'm not sure what issue you're facing. I regularly purchase and download books to my various Kindle devices and then take the devices to locations without connectivity and happily read. It usually works pretty smoothly. The Kindle will need to be connected to wifi while it is downloading, and you also need to connect to your Amazon account with your password. Hi Leo,My daughter just bought me a kindle 2, one drawback i find is if you go in to look at books as in free books of which there are over 4000 and you get as far as say 600 and you shut down the kindle or go on to something else on the kindle, if you want to look at the free books again you must start from number one again that is if you had shut down the kindle, is there any way around this so that you can avoid starting again at number one. I find this offputting. I'm not aware of a way to preserve the place - either on the Kindle or on Amazon's web site. Whenever I know I'll be looking at a LOT of books, I find the website using a "real" computer easier to navigate. I actually buy very little through the on-device store. I have a smart phone with a Kindle app - love it. My only real complaint is that when I used to buy real books I could give them away when I was done - not any more but if I have my phone and I am waiting anywhere I can read - how great is that? Buy a Nexus 7 instead and install the Kindle app or stay with the Kindle 3.